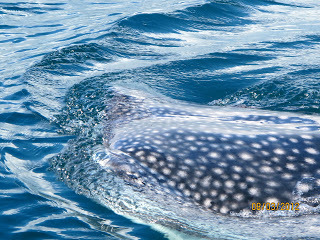 Whale Sharks Sighting at Nicuesa Lodge! Everyday we have to keep our eyes open to find pleasant surprises in the waters of the 'Sweet Gulf' (Golfo Dulce), where Playa Nicuesa is located. 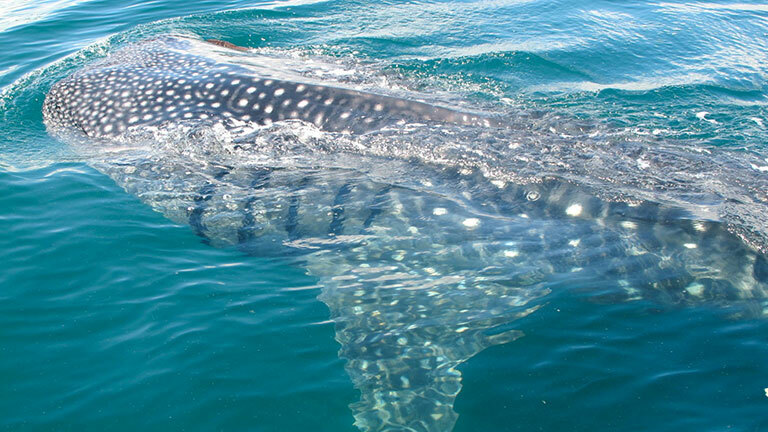 During this past month, our guests and guides spotted something usually big coming from our tours in the Golfo Dulce... Whale Sharks swimming very close to their boats! Even though they are called whale sharks, this animal is completely unrelated to marine mammals such as whales. The reason for its name lies in the fact that it is as large as some species of whales, and also lacks teeth and instead is a filter feeder (like many whale species). It gets to be as large as 12 meters in length, making it actually the biggest fish that exists on the planet! It takes a long while for a 50-centimeter newborn to reach the maximum size. But the whale shark has time, as it is estimated to live some 70-100 years. These gentle giants are capable of diving to great depths, but they also stroll slowly on the ocean surface, mouth wide open, collecting plankton and small fish. Some have been reported to synchronize their migrations to coincide with massive spawning of fish, which provide a good opportunity to feast on eggs and sperm. On these feeding occasions they gather in groups that may range from just a few near the coastline, to (rarely) several hundred in offshore waters. Since they feed only on microscopic, or very small creatures, they do not represent any danger to humans. Also, the fact that they almost don't have any natural predators, makes them a very mellow animal, attractive to people that while diving or snorkeling might want to take a close look or even get a ride holding from the dorsal fin. Although, this common practice is highly discouraged by shark specialists and conservationists. In April of 2012 this amazing synchronized migratory gathering was observed right here in the Golfo Dulce! 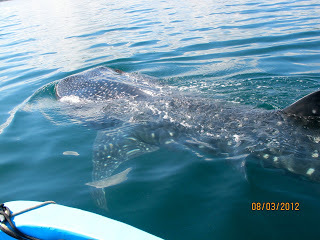 Right before the my very startled eyes a group of 8-10 whale sharks calmly wandered near the coast by the town of CaÃ±aza. Words cannot really express the feeling of such an experience, which is for many, only once in a lifetime. WHAT A HUMBLING AND AWESOME EXPERIENCE! !